DARTMOUTH -- Dr. Michael F. Collins became the seventh chancellor of the University of Massachusetts at Boston yesterday by a unanimous vote of university trustees, as protests promised by supporters of interim chancellor J. Keith Motley failed to materialize. Motley, who would have been the first black chancellor of the Boston campus, watched stoically as the UMass Board of Trustees appointed Collins, a physician and former health care executive, by a unanimous vote. The decision by UMass president Jack Wilson to recommend Collins for the job instead of Motley sparked harsh criticism by minority legislators and activists, who called it a lost opportunity to diversify city leadership. But critics were silent at yesterday's board meeting, quieted, one said, by Motley's decision to accept another job offered by Wilson. 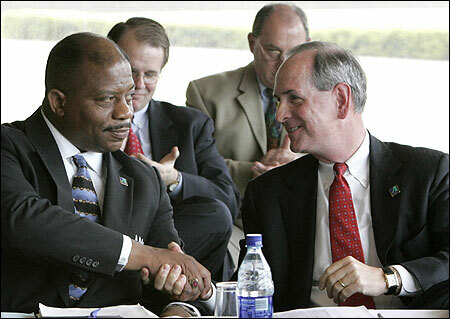 UMass administrators announced the day before the meeting that Motley had agreed to become a vice president of the five-campus UMass system. The vote capped a week of heated rhetoric from those disappointed by the decision, some of whom suggested that Motley would have been chosen if he were white. Motley worked in student affairs at Northeastern for 25 years, including a decade as dean, and was hired by UMass-Boston as vice chancellor of student affairs two years ago. Named interim chancellor last summer, after the departure of the last chancellor, Jo Ann Gora, Motley was embraced by students, who said he listened to their concerns, and by community leaders, who said he repaired relations strained by Gora. But Wilson said Collins presented the strongest resume, anchored by a decade of experience running Caritas Christi Health Care System, the Boston-based Catholic hospital network. Collins, a 49-year-old Walpole native who attended Tufts medical school, stepped aside as chief executive at the request of the Archdiocese of Boston last spring. He has declined to discuss details. Motley said in an interview yesterday that he accepted the promotion to vice president so he can stay in Boston and pursue his passion for public education at a senior level. Because he feels strongly about the need for UMass-Boston to move forward from the controversy, Motley said, it would have been hypocritical and counterproductive for him to add to the unrest by delaying his acceptance. ''If the campus community is in disarray, then all the hard work of the past year would have been in vain," he said. Motley and Collins met for the first time at yesterday's board meeting, held at UMass-Dartmouth, and in a symbolic gesture of reconciliation, it was Motley who attached a gold UMass-Boston pin to Collins's jacket after the vote, welcoming him to the university. The two men sat side by side for the rest of the meeting and spoke briefly; Motley said he told the new chancellor, ''Hello, congratulations, and good luck." In formal remarks to trustees after the vote, Collins joined Wilson and trustees in thanking Motley for his work on campus. ''I look forward to partnering with him during the transition and for many years to come," he said. The new chancellor called the controversy and the characterization of Wilson's decision as racist by some critics ''painful." ''When I entered medical school, it was with the intention of becoming a healer . . . yet the events of the past week shall call on my commitment to healing in a way I never expected," he said. Collins said he plans to spend time on the Boston campus today walking around and talking to people. Motley, who said he's not sure when he will start his new job, plans to invite Collins to participate in UMass-Boston's commencement next week. The chancellor search began last fall with a 22-member committee, including students, staff, and faculty, which narrowed the pool to three finalists: Motley, Collins, and University of Michigan general counsel Marvin Krislov. The selection of finalists also sparked protest after word leaked out that Motley lacked support. Only one of the five UMass campuses, the Amherst flagship, has had a black chancellor. Randolph Bromery led UMass-Amherst from 1971 to 1979. Minister Don Muhammad of the Nation of Islam, who called for UMass trustees to delay their vote at a protest outside Wilson's office Tuesday, had planned to speak at the board meeting yesterday, but did not attend. He said later that he skipped the meeting because of Motley's decision to accept the new job and because Wilson met for more than an hour with a small group of critics, including Muhammad and local NAACP president Leonard C. Alkins, after Tuesday's protest. ''Keith and the school came to agreement, and as long as Keith's satisfied, I'm satisfied," said Muhammad, who is Motley's former father-in-law. ''We met with Dr. Wilson, and I'm looking for him to put into place the things we discussed. He said he would reach out to the community and have the community more involved." Another critic of the decision, UMass-Boston professor Jemadari Kamara, said a personal matter caused him to miss the board meeting. Noushin Ashrafi, the chairwoman of UMass-Boston's faculty council, read a statement at the meeting that endorsed Collins, expressed gratitude to Motley, and appealed for unity on campus. The statement was not voted on by the council, but represents the view of many professors, Ashrafi said. ''Dr. Motley consistently promoted the ideal of 'one community' for UMass-Boston," the statement said. ''It should be the goal of the campus and the entire faculty to preserve that principle as we unite behind our new chancellor, and to resist any effort to divide or polarize the community."